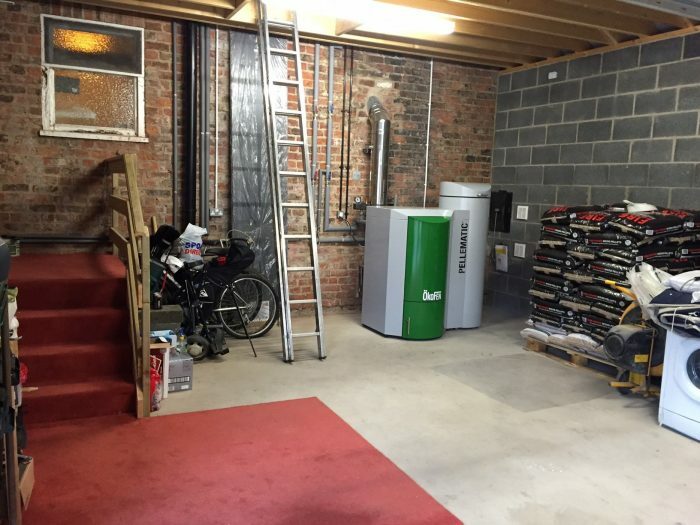 Biomass boiler maintenance differs from fossil fuel boilers in that the ash they produce by the combustion of their fuel must be disposed of. A helpful way of finding out when your biomass boiler needs cleaning is to note increases in the flue gas temperature as the heat produced is wasted and extracted through the flue. Depending on the quality of the fuel used, wood combustion can produce between 0.5-1.5% of their weight in ash. The ash is held in an ash pan located beneath the grate. This collected ash must be removed. Manually removing the ash at regular intervals is necessary, and the regularity of these intervals will vary depending upon how often the boiler is used for heating. Automatic de-ash systems can be used to empty the ash into an ash bin, thus lessening the work load required, but the ash bin itself will still need to be emptied from time to time. Adding to the environmental friendliness of biomass boilers, the collected ash can be used as a fertiliser for wood. The flue and chimney, as is the case with any solid fuel appliance, must be swept at least once every year. 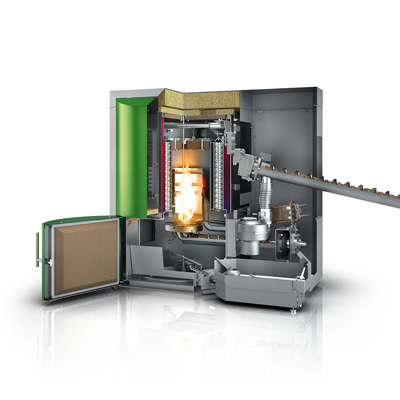 The major by-product of biomass fuel burning is the biomass boiler ash is creates. The ash created by biomass boilers and their fuel is potash. Potash is considered valuable by farmers as a top dressing and can also be used by horticulturalists as a component of their compost, and you should be able to find someone who would be interested in using the biomass boiler ash as a fertiliser if you are not interested in using it yourself. Disposing of ash in this way is highly environmentally friendly, as the nutrients of the ash are fed back into the earth possibly to regenerate the wood that was collected to form the fuel in the first place. This is especially important as the popularity of biomass fuels increases and the need for wood regeneration grows. If you cannot dispose of your biomass boiler ash as a fertiliser, or if the ash produced is only of a very small amount, you can dispose of it as landfill waste. In cases where a large boiler is fitted with flue gas cleaning equipment and the fly ash is collected separately, the ash may have to be classed as special waste due to concentration of any heavy metal in the fly ash exceeding a threshold value. At the moment there is not any regulation in the UK to stipulate that bottom ash and fly ash must be separated. 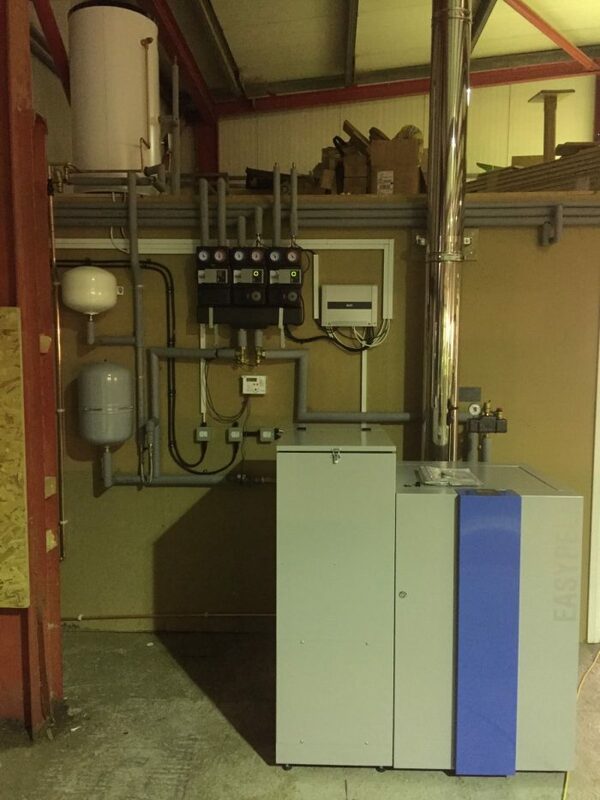 Whilst manufacturers will supply basic notes on the cleaning and servicing of your biomass boiler, regular checks by a recommended service engineer are necessary for more thorough servicing. Service engineers will be able to spot any parts of the boiler not operating at the greatest possible efficiency and will be able to recommend any changes or replacements required. The service engineer to keep the equipment running smoothly can also oil the mechanical components of the boiler. A service engineer should check the boiler once every six months to a year and it is generally more cost effective to schedule regular checks rather than to hire an engineer to carry out repairs, which could have been avoided. Make sure to hire a HETAS quality assured engineer to check your boiler. Internals within the heat exchanger is thoroughly inspected and cleaned. All airway ports, primary and secondary are cleared of carbon build up. Geared motor units, seals, and bearings checked and greased where necessary. Inspection of the automatic ignition system. Upon completion, a service report will be issued and notification of any remedial work required. Upon completion, a service report will be issued with data attached and notification of any remedial work required. Call outs Breakdowns can usually be attended by our experienced diagnostic engineers within 48 hours. Priority call outs are usually attended within 24 hours. All workmanship is guaranteed for 10 years. Regular servicing will reduce the risk of breakdown, improve quality of emissions, maintain combustion efficiencies and help prolong the life of your boiler as well as save on fuel. Plus in order to qualify for the Renewable Heat Incentive and comply with the warranty conditions your boiler must be serviced in accordance with manufacturer’s recommendations. Any further bolt-on options can be added as required ensuring you only pay for what you need. For more detail of our bolt-on options or to enquire about bespoke support for your plant room please contact a member of our team. Following each service visit our engineers will complete a full maintenance report detailing any observations, repairs or adjustments made – ensuring you can build up a full service record for your system.